Compositions will be drawn from the music recorded on their triple vinyl October 2019 release RAGMALA (A Garland of Ragas) on Meta/BRM records. Brooklyn Raga Massive has been making waves for their role instigating what the New York Times, New Yorker, and Wall Street Journal have called a “Raga Renaissance.” The Go: Organic Orchestra with Adam Rudolph has been pushing the boundaries of large ensemble creative music for over 20 years, collaborating with musicians such as Yusef Lateef, Bennie Maupin, Don Cherry, Sam Rivers, Pharaoh Sanders, and L. Shankar. 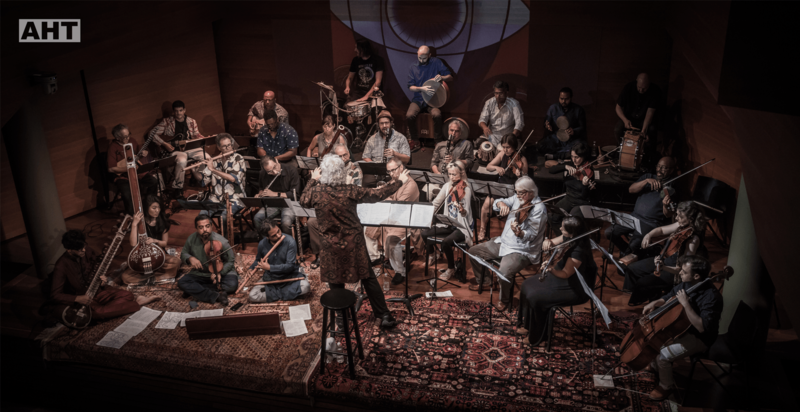 This ambitious project brings together Brooklyn Raga Massive and Go: Organic Orchestra into a synergistic exploration of raga, India’s classical music and contemporary creative music. Composer Adam Rudolph’s hypnotic polyrhythmic explorations propel a spontaneous conducted group of over 20 musicians including legends of the African-American creative music, such as Hamid Drake and Gnawa master musician Hassan Hakmoun. For the past four decades composer, improviser and percussionist Adam Rudolph has performed extensively in concert throughout North & South America, Europe, Africa, and Asia. Rudolph has been hailed as “a pioneer in world music” by the NY Times and “a master percussionist” by Musician magazine. He has released over 25 recordings under his own name, featuring his compositions and percussion work. Rudolph composes for his ensembles Adam Rudolph’s Moving Pictures, Hu: Vibrational percussion group, and Go: Organic Orchestra, an 18 to 54 piece group for which he has developed an original music notation and conducting system. He has taught and conducted hundreds of musicians worldwide in the Go: Organic Orchestra concept. In 1995 Rudolph premiered his opera The Dreamer, based on the text of Friedreich Nietzsche’s “The Birth of Tragedy”. Rudolph has performed with Don Cherry, Jon Hassell, Sam Rivers, Pharaoh Sanders, L. Shankar, A.A.C.M co-founders Fred Anderson and Muhal Richard Abrams, Wadada Leo Smith, and Omar Sosa. He has toured extensively and recorded 15 albums with Yusef Lateef including duets and their large ensemble compositional collaborations. Born in 1955, Rudolph grew up in the Hyde Park area of the Southside of Chicago. From an early age he was exposed to the live music performances of the great blues and improvising artists who lived nearby. As a teenager, Rudolph started playing hand drums in local streets and parks and soon apprenticed with elders of African American improvised music. He performed regularly in Chicago with Fred Anderson and in Detroit with the Contemporary Jazz Quintet. In 1973 Rudolph played on his first record date with Maulawi Nururdin and with the CJQ at the Ann Arbor Blues and Jazz festival. In 1977 he lived and studied in Ghana, where he experienced trance ceremonies. In his travels throughout West Africa he saw how music can come from a cosmological grounding beyond music itself and can also be about something beyond music itself. In 1978 he lived in Don Cherry’s house in the Swedish countryside. Cherry inspired him to start composing and showed him about Ornette Coleman’s concept and the connection of music to nature. Rudolph is known as one the early innovators of what is now called “World Music”. In 1978 he and Gambian Kora player Jali Foday Musa Suso co-founded The Mandingo Griot Society, one of the first groups to combine African and American music. In 1988, he recorded the first fusion of American and Gnawa music with Sintir player and singer Hassan Hakmoun. Rudolph intensely studied North Indian Tabla for over 15 years with Pandit Taranath Rao. He learned hundreds of drum compositions and about how music is a form of Yoga – the unity of mind, body and spirit. In 1988 Rudolph began his association with Yusef Lateef, with whom he has recorded over 15 albums including several of their large ensemble collaborations. Lateef introduced Rudolph to the inspirational practice of Autophysiopsychic Music – “that which comes from one’s spiritual, physical and emotional self”. Rudolph still performs worldwide with Dr. Lateef. Their performances have ranged from their acclaimed duet concerts to appearances as guest soloists with the Koln, Atlanta and Detroit symphony orchestras. Rudolph continues to also create visual art – painting, drawing, photography – and to write. In 2006, his rhythm repository and methodology book, Pure Rhythm was published by Advance Music, Germany. In 2010 Rudolph’s article Music and Mysticism: Rhythm and Form was published in Arcana V, edited by John Zorn. Other essays have been published by Parabola Magazine and Morton Books. Rudolph has been on the faculty of Creative Music Studio ( New York and Istanbul) Esalen Institute, California Institute of the Arts and the Danish Jazz Federation Summer Institute. Rudolph has received grants and compositional commissions from the Rockefeller Foundation, Chamber Music America, Meet the Composer, Mary Flagler Cary Trust, the NEA, Arts International, Durfee Foundation, Phaedrus Foundation and American Composers Forum.